Side Note (8/19/18): I did not review the first two books of this series--reviewing this last book was a last minute whim. But rest assured, I also enjoyed the first two books. But there's a more immediate threat: The Skeleton King plots to claim the Fifteen Realms for his own. With armies in disarray and the dead not staying down, Avry's healing powers are needed now more than ever. Torn between love and loyalty, Avry must choose her path carefully. For the future of her world depends on her decision. I wish I would take the time to write down thoughts about a book when I get them, because otherwise, I end up sitting in front of my computer, hours later, and not quite certain what I want to say about it. Taste of Darkness wraps up the Healer series decently, and I guess I didn't realize I was looking forward to reading the conclusion to this trilogy until I finally got my hands on it (when it became available through my library's e-book collection). There was an addictive excitement coming over me as I read this fast-paced story despite (and maybe even in spite of) all the many flaws that poked at me. In the end, however, I found enjoyment in Taste of Darkness as well as the entire Healer series altogether. Like Maria V. Snyder's Study series that I just finished, there are distinct writing style and story tone quibbles that were hard to ignore (even though I tried to ignored them anyway), but the characters and the story itself weren't too bad. I'll admit, I liked the concept of how the Healer's powers worked, even if I wasn't too thrilled about the rest of the magicians' powers. Some of the mechanisms revealed in this book (the plague's origin and cure, the revival of certain characters, how the Death Lilies and Peace Lilies were, etc.) were a bit questionable. Also, I've never been too fond of the POV switching writing style, especially going from a first person to a third person -- it's a little messy. At the very least, there's a happily ever after (something I'm never too ashamed to admit that I love seeing in any story). 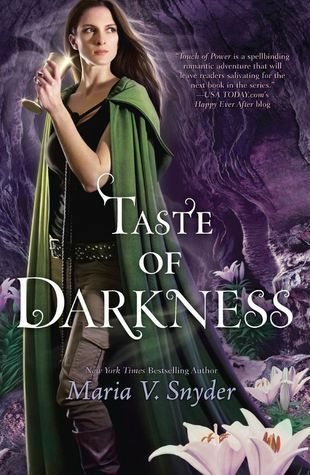 As a whole, Taste of Darkness held together better than the second book, Scent of Magic, but I overall enjoyed the first book, Touch of Power more than the aforementioned two books. Things seemed to get really haphazard in this last book with the war and the evil villains and the discoveries... but for some reason, I'm willing to overlook all of that because I DO like the characters. And was Avry always such a smartass? I can't remember, but I'm not complaining. I'll admit that since I DID just finish reading the Study series, I couldn't help but make some comparisons. And in all honesty, of the six books total, Poison Study was the favorite and the Study series was the more enjoyable of the two series. I liked both heroines equally (between Yelena and Avry), but I didn't care too much for Kerrick; there had been none of that mental fist pumping action I did whenever he made his appearances (not like when Valek entered a scene to join Yelena in the Study series). The ragtag group of the Healer series, however, was a little more memorable than the supporting characters of the Study series. At this point, I really should just stop doing comparisons though, but I had so little to really say about Taste of Darkness itself that I felt like I needed to fill this post with other random opinions. Nonetheless, my conclusion of the Healer series is that I'm satisfied with it. Maria V. Snyder may have just become one of those authors I always perk my ears up at now. I am planning on reading the rest of her other series and I will probably continue to follow all of her new releases. Somehow, even with some mundane writing, but great story telling, she's managed to capture my heart. This review was originally posted at Ani's Book Abyss / BookLikes in April 2014. Halloween Bingo 2018 | Take Your Head Start!